The Research Project MeLa* - European Museums in an age of migrations was a four year multidisciplinary and collaborative Research Project involving nine European Partners, which was funded in 2011 within the 7th Framework Programme of the European Commission. The MeLa project ended in February 2015. The main outcomes of the MeLa* Project are illustrated in the MeLa* Book Series, an collection of open-access digital publications currently including 11 volumes. The objectives of the MeLa Project focused on the investigation of the impact of contemporary migrations of people(s), objects, information and cultures on museums, and on the identification of innovative policies and practices enhancing the role of these institutions towards a changing political, social and cultural context. The main outcome of the research is summarised in a Final Brochure, providing an overview on the main Project findings. This is draught through twelve propositions, which come with a set of implications and recommendations; they are addressed to the scientific community, museum professionals, policy makers and the European Commission, in order to draw directions and clues for the enhancement of the role of museums in this “age of migrations”. The MeLa* Critical Archive is a digital platform aimed at cohering, conveying and sharing the main investigations developed within the MeLa Project through a critical post-reflection. It has not been conceived as a mere repository of the research outcomes, but rather as a multipurpose tool. As a communicative project, it aims at representing the complexity of the approaches developed by MeLa, and illustrating its findings as a unitary jet multifarious cultural proposal. As a research instrument, it has been implemented in order to enhance synergies among the different research activities and outcomes, fostering interdisciplinary cooperation and opening further perspectives. The design of the Archive was developed to provide multiple possibilities in accessing its contents, which can be browsed through an index, or explored through the main interface. The latter exploits the metaphor of a sky map, and offers an unstructured navigation allowing the reconfiguration of contents. RF01 examined the historical and contemporary relationships between European museum representations and identity within the contextual structure of place. RF02 examined the question of memory to reassess its relationship with identities and migration, and redefine its role in the social spaces of museums. 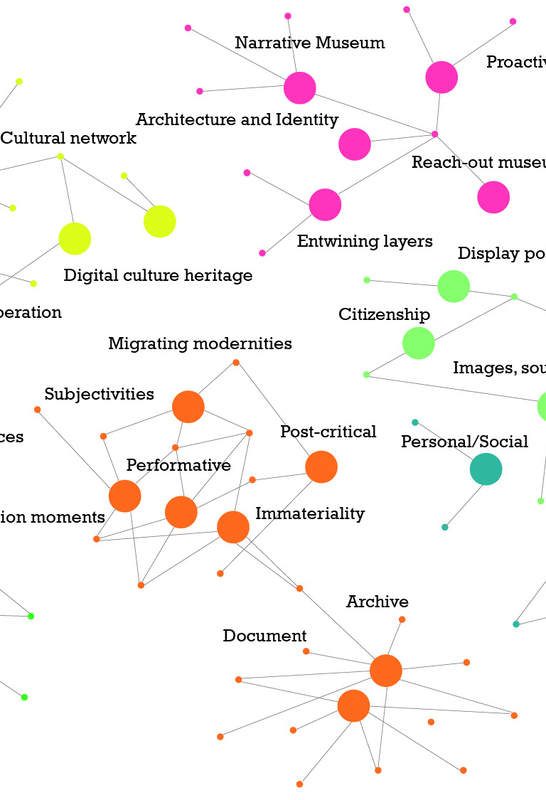 RF03 aimed to investigate, identify and propose innovative coordination strategies between European museums, libraries & other public cultural institutions. RF04 explored new approaches to the relationship between art, migration and representation within the contemporary exhibition sector. RF05 explored and experimented with the potentialities of communication technologies in the renovation of museum approaches and practices. RF06 aimed to identify and envision innovative exhibition strategies, approaches and tools, enhancing the role of European museums in this “age of migrations”.